One advantage of having parents who only redecorate when the old wallpaper physically falls off the walls is that 27 years later you can still find Gil Gerard (the producers couldn't afford Harrison Ford) and Erin Gray on your bedroom wall as 'Buck Rogers in the 25th Century' and his sidekick Wilma Deering. How I remember the excitement at the age of 11 when I was allowed to choose my very own wallpaper for ONE wall! And the little shop along a side street which sold this surprise in amongst all the swirls, Anaglypta and woodchip. It might even have been around the time when I called upon my not inconsiderable powers of imagination - fired up by Michael Jackson's Thriller video no doubt - to fantasise that my one-horse Northern Irish home town was actually in America - a suburb of LA - for one entire Saturday. After watching Multi-Coloured Swap Shop on TV of course. What a magical day that was, tho' I still can't imagine how I did it, even though my town has now increased to at least two horses with its own M&S, Starbucks AND Caffe Nero! LOL - that wallpaper brings back memories. ONe time when we moved when I was younger, I quickly picked my bedroom as the second oldest because I didn't want to get stuck with the Spider Man wallpaper that I knew my parents wouldn't get around to taking down. So my poor little sister ended up in that bedroom for a few years. She didn't seem to mind it but I was pure girly girl and couldn't have Spidey on my walls! Awww that is rather lovely. I always think though that it feels very very weird to go back and sleep in a childhood bedroom. I don't think I have ever watched Buck Rogers. Not that I didn't respect you anyway, Laura, but my respect has now increased tenfold with that wallpaper. I loved Buck Rogers as a kid and nursed secret desires for Col. Wilma Deering that only a sci-fi geek boy could nurse. They were repeated on one of the cable channels last year and, sad to say, I still enjoyed them. Biddi biddi biddi...! Welcome back - I'm quite jealous of that wallpaper, though obviously I would have prepared Teeni's sister's Spidey paper. But I did hate Twikki. welcome back!! Being a girly girl myself (well, back then I was) I had all pink walls on the first room I was allowed to decorate. Candy floss pink if I recall correctly! Yuk. Got jugular red now. 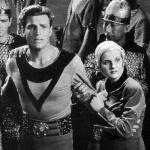 Flash Gordon was a staple of Saturday kids cinema in the 1950s. Much loved by little boys. You could see the wires holding up the spaceships as they cranked slowly across the screen with, no doubt, someone secreted inside holding the firecracker that provided the sparks. Oooo, that wallpaper is way retro cool. Too bad you can't peel it off and frame it! I find myself disappointingly predictable. So did you get some Wonderwoman paper in your room Teeni? Thanks RB - it is a bit surreal to go back, I must admit. Particularly when I look in the mirror and expect an 11 year old to look back at me, since nothing else has much changed! Steve, you are too kind. I've always has a secret geek side. And sad to say I still love that wallpaper! Rol I did look under the stairs to see if there was a spare roll, but alas not. I now see from all the comments I could have sold such on e-bay for a fortune! Sagittarius, you didn't get your current colour scheme by taking your (H&S inspector in slaughterhouseses) work home with you I trust? Old Fogey, you bring it all back! Despite my not being around in the 1950's. Moi, thank you. It is lovely that it has had such a good reception here. When it finally falls off, I will certainly frame it! When Mr Fishwife and I go to stay with his mother, his bedroom has still got the Mr Men wallpaper from when he was 7... Not that she's kept it as a shrine or anything, I think she can't really be bothered to redecorate... who can blame her when Mr Bump is so pathetically adorable?